The United Nations World Food Programme (WFP), the Bill & Melinda Gates Foundation, and the Howard G. Buffett Foundation on September 24th unveiled a groundbreaking initiative to help poor farmers across the developing world significantly increase their incomes. The majority of the world’s poorest people live in rural areas, and most rely on agriculture for their food and income. Volatility in the food commodities and fuel markets has profoundly destabilized their already fragile economic situation. Millions of people have been pushed deeper into hunger and poverty. The new initiative, Purchase for Progress (P4P), is expected to help hundreds of thousands of small farmers’ access reliable markets so they can sell their surplus crops at competitive prices, bolstering fragile local economies. The initiative will also seek to promote local food processing projects to provide food of high nutritional value, allowing farmers to gain the maximum benefit from their crops. “P4P will help large numbers of small-scale farmers to become net producers rather than net consumers, ensuring that they stand to gain rather than lose from the current climate of rising food prices,” said Howard G. Buffett, president of the Howard G. Buffett Foundation. The Bill & Melinda Gates Foundation, the Howard G. Buffett Foundation, and the government of Belgium have committed US$76 million to this effort to transform the way WFP purchases food in developing countries, with a special focus on Sub-Saharan Africa and Central America. The initiative was announced during the United Nations General Assembly, where progress towards the Millennium Development Goals and the global food crisis are high on the agenda of world leaders. Developed in partnership with the foundations, P4P will be launched in 21 pilot countries over the next five years. Innovations in WFP’s local food procurement practices, which are central to the agency’s new business model, aim to strengthen the role of smallholder and low-income farmers in agricultural markets and enable them to gain more from supplying food to the WFP’s global operations. WFP will align its efforts with organizations such as the Alliance for a Green Revolution in Africa (AGRA) that are focused on helping small farmers increase their productivity through the use of improved seeds and farm management techniques. 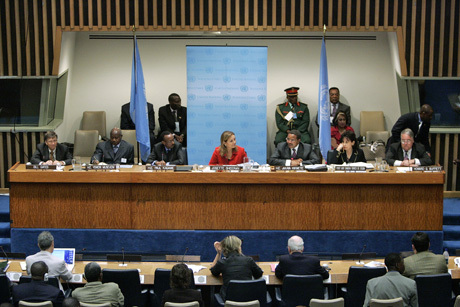 Sheeran was joined at the United Nations by Bill Gates, co-chair of the Bill & Melinda Gates Foundation; Howard G. Buffett, president of the Howard G. Buffett Foundation; President Jakaya Kikwete of Tanzania; President Paul Kagame of Rwanda; President Yoweri Museveni of Uganda; and First Lady of Guatemala Sandra Torres de Colom. WFP is the world’s single largest purchaser of food for humanitarian operations that include relief and safety net programs such as school feeding. In 2007, while assisting 86 million hungry people, the agency spent US$612 million on food in developing countries. With P4P, WFP will explore different ways to use its purchasing power in developing countries to maximize gains for small farmers while minimizing any distortion to local markets. By supporting small farmers’ ability to produce and supply food to WFP’s global operations, P4P will help them increase their incomes, which is critical in addressing hunger and poverty at their roots. The Bill & Melinda Gates Foundation committed US$66 million to fund pilot projects in 10 countries in Africa, and the Howard G. Buffett Foundation committed US$9.1 million to support pilot projects in seven countries. The government of Belgium contributed $750,000 for the project in the Democratic Republic of Congo. Three other countries have not yet been funded. rigorously test practices that can be used to benefit small-scale farmers in other countries. Ultimately, the intention is to not only support farmers to capitalize on the market offered by WFP, but also to connect them to other local and regional food markets. The UN World Food Programme (WFP) is the world's largest humanitarian agency and the UN’s front-line agency for hunger solutions. This year, WFP plans to feed around 90 million people in 80 countries. Guided by the belief that every life has equal value, the Bill & Melinda Gates Foundation works to help all people lead healthy, productive lives. In developing countries, it focuses on improving people's health and giving them the chance to lift themselves out of hunger and extreme poverty. In the United States, it seeks to ensure that all people—especially those with the fewest resources—have access to the opportunities they need to succeed in school and life. Based in Seattle, the foundation is led by CEO Jeff Raikes and co-chair William H. Gates Sr., under the direction of Bill and Melinda Gates and Warren Buffett. The foundation invests across the agricultural value chain—from seeds and soil to farm management and market access—so that millions of small farmers have tools and opportunities to overcome hunger and poverty. The foundation believes that strong partnerships and a redoubled commitment to agricultural development across all sectors could help hundreds of millions of people—and entire regions—move out of hunger and poverty and build better futures. of soil fertility, agronomic training, participatory farmer research, and development of drought-tolerant and virus resistant crop varieties to increase crop yields. The foundation believes that building strong extension services, maintaining agro-diversity respecting cultural differences, and utilizing new technology will play an important role in addressing food insecurity in less developed countries.